Shapur II AR Drachm, Extremely Fine, 309 - 379 C.E. 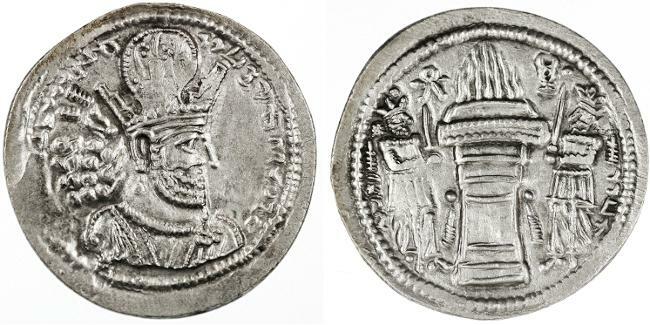 SHAPUR II AR DRACHM, 309 - 379 C.E. SUPERSHARP!! Shapur II is also know in the Talmud as Shevor Malka who was involved with Rabba bar Nachmani. He was declared king while in his mothers womb, which accounts for his extraordinarily long reign and his mother's influence at the royal court. Holyland Pilgrim's Flask CHOICE and SCARCE, Late Bronze Age II, Circa. 1200 B.C.E. Tiberias, Hadrian, VF+, Circa. 119/120 C.E. Macedon AE26, VF+/VF, SCARCE Alexander on horseback, 238 - 244 C.E.